You are here: Home / Apps and Workflows / Reading and Annotating / Sente vs. Papers: What is the best PDF management system? Do you remember the first thing that crossed your mind when you first saw an iPad? In my case, I was thinking how great it would be to read and annotate PDFs on it! Serious academic readers are wise to invest some time and money into a dedicated PDF management system for their read-cite-write workflow. With Mendeley and Bookends not supporting annotations on the iPad, there are only two contenders in the race for the best PDF management system: Sente and Papers. If you are on the fence between these two, you have to read this article. App Store links: Sente ($20), Papers ($15). Mac / Windows links: Sente ($90) and Papers ($80). Since both ecosystems will set you back around a hundred dollar, you might have a hard time deciding which app is the best for you. But even more important than the money is the time you will spend in developing your library. In order to avoid sunk time costs in the future, it is important to consider not only current but also future needs of your read-write-cite workflow. But don’t fret: academiPad is here to help! My conclusion is that both are decent ecosystems, and you will fare well with both of them. Sometimes, the differences between both ecosystems are negligible (e.g., adding references, price). However, Papers and Sente differ in the scope of their ecosystem, how references are organized, and what annotations can be done. What is the setup of your ecosystem: Do you share your library with other researchers (or computers) who are geographically dispersed? Do you need to integrate Windows computers into your ecosystem? How do you want to organize PDF articles: Are you okay with organizing PDFs through tagging, or do you prefer organizing them in a folder structure? What is your annotation style: How do you use annotations to structure the text? Do you want to make quotes? How important is it to have all your notes at one place? Papers has the wider ecosystem (including a Windows app) and is easier to use. Sente is more difficult to get used to, but has more powerful syncing, organizing, and annotating capabilities. It is a tough call, indeed. Heck, finding my dissertation topic seemed easy in comparison! However, there is one knock-out criteria that might make your decision very simple, and that is the scope of the ecosystem. If you are using a Windows machines, you can stop reading right now. Why? Because Papers is the only PDF management system that also has an app for Windows PCs. And since the iOS version of Papers is a universal app, which means that you can access your library also on your iPhone or iPod touch, Papers definitely wins the price for the larger ecosystem. However, the downturn is that Papers requires a WiFi connection to sync with the iOS companion app, and syncing between different Macs / PCs is not supported at all (though this might change). If you want to sync your library with other devices that are not in reach of the same WiFi network (e.g., you want to share a library with a co-author who lives in a different town, or you have two computers at work and at home), you have found a new best friend in Sente. Sente syncs your library between multiple Macs and iPad companion apps via the cloud, which makes it much easier to keep your library (including annotations) up to date across all your devices. There is no iPhone app for Sente; however, Sente also offers a free reader app for the iPad, which allows you to share your library with co-authors without coercing them into buying an expensive iPad app. How much you like the design of the user interface and how in-text citations are handled (part 2). Sente puts a lot of emphasis on tagging as a way of sorting through your library. Instead of creating a hierarchy of manual collections, the best way to organize your papers in Sente is to structure your database through a hierarchy of Quicktags and smart collections (please see the Sente for Mac article for more details of how this works). While it is possible to create manual collections in Sente, this makes little sense, as they won’t be synced between devices. Papers, on the other hand, is mostly based around manual collections. I find that this approach makes Papers a little “easier to get” when you are new to building your library, because it more closely resembles how you would organize PDFs in the Mac Finder or Windows Explorer. Since Papers is able to sync manual collections between Mac/Windows and iPad, you probably will be happier with Papers if you prefer the “Finder” or “Explorer” way to organize your PDF library. Of course, Papers also has smart collections and keywords (Papers’ name for tags), but it is not possible to apply a hierarchy to smart collections or keywords. Bottom line: While Sente’s way of organizing PDFs is pretty much based on tags, Papers treats tagging more like an afterthought. If you are comfortable with using tagging as your main tool of organizing references, Sente is the right choice for you. In my opinion, tagging is the way to go, because it makes organizing your references (or any files) much more flexible. But tagging is not for everyone, and Papers is the only choice you have if you want to sync manual collections between Mac/PC and iPad. Another big difference between both ecosystem lies in what annotation features are available and how they are implemented. Both ecosystems offer decent annotation workflows, but also have enough room for improvement. 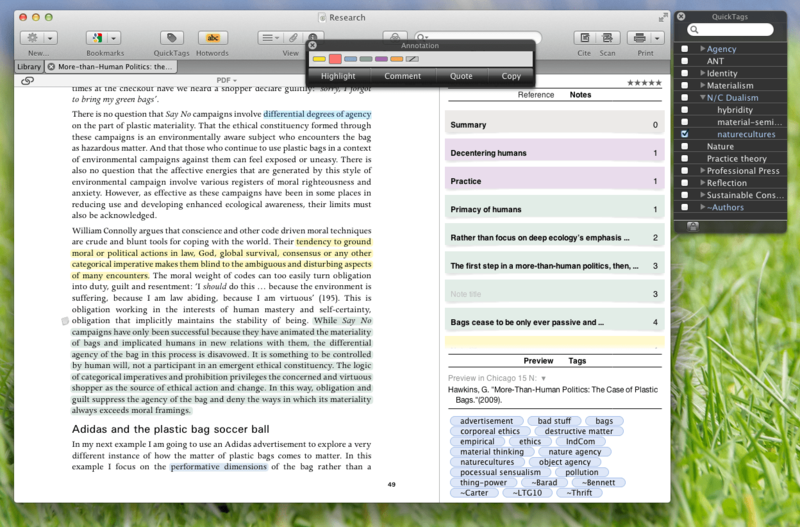 For example, neither of them can match the ease and simplicity of how annotations are done in the new iBooks textbooks. In my opinion, Apple set the bar to highlighting on the iPad with that one, and I am hoping that Papers and Sente will continue to fine-tune their annotation workflows until highlighting becomes so unobtrusive that we forget we are actually doing it. But until then, we have to live with the fact that neither ecosystem offers an excellent workflow. And just to make things a little bit more complex, Papers offers a smoother highlighting workflow on the iPad, while Sente is best in class when it comes to highlighting on the Mac. Sente for iPad offers two annotation workflows, but both of them are choppy to some extent (e.g., you can’t change colors after you highlighted). In comparison, Papers’ highlighting workflow for the iPad is more polished. Please check out the videos in the Papers for iPad and Sente for iPad posts in order to get a better idea on how highlighting works in each app. The situation reverses on the Mac: Here, Sente’s pop-up menu for highlighting and annotation is smooth like silk, while highlighting in Papers for the Mac requires you to do some extra clicks with your mouse or some keyboard shortcuts. You can download a free trial version of both Mac apps to try out highlighting first hand. Sente’s annotation features and workflow on the Mac are best in class. However, the bottom line is that, while both ecosystems offer you some decent highlighting workflow, neither of them is perfect right now. Also, both developers will probably continue to tweak their highlighting workflow. Since you don’t have a crystal ball to see who comes up with the smoothest highlighting workflow, what do you do? The best thing you can do to decide whether Sente or Papers is a better tool for your annotation needs is to look beyond highlighting. When it comes to things like notes and comments, there are some glaring differences between both ecosystems. Papers lets you do overall notes on a document level and sticky notes throughout the text. These “sticky notes” can be either assigned to a particular text passage or can freely float on the page; however, you won’t be able to read the notes unless you open them on the page where they are made. Sente, in contrast, presents you all your notes, comments, and even quotes not only where they are made, but also pulls them together in an overview plane. Sente’s overview plane and quotes allow you to pull out the core aspects of a paper in one single spot, which makes reviewing the paper at a later point in time a lot easier. UPDATE: Papers for Mac now also has an overview plane displaying notes and highlights. It is not colour coded though. This article has covered the main differences between Sente and Papers. However, the big showdown between Sente and Papers is not over yet, as both ecosystems follow a different design philosophy with regards to their user interface and how references are cited. You can read about these and other features, as well as my personal conclusion what ecosystem fits my individual needs best, in the second part of the big show-down between Sente and Papers. Also, feel free to check out the other posts on Sente and Papers (see above), and don’t forget to subscribe to academiPad’s free email list or RSS channel in order to stay up to date. If you have already made up your mind, you can proceed here: App Store links: Sente ($20), Papers ($15). Mac / Windows links: Sente ($90) and Papers ($80). There is a BIG PROBLEM !!! Bookends, with Bookends On Tap, the companion for iPad, supports every kind of PDF annotation on iPad … I think it is at least at the same level of Sente and Papers, but the app on the Mac is more stable (albeit old-fashion) !!!! Bookends now does support annotation on ipad and it’s bidirectional.So, game over? I’ve been using Papers on Mac and iPad for several years and I was happy until last summer, when I changed the sync between my Mac and the iPad from “bidirectional” to “from Mac to device”. What a disaster! Since then, the sync between Papers on my Mac and on my iPad doesn’t work anymore (only a 1/10 of my library is copied on my iPad). I’ve lost many hours trying to fix it, unsuccessfully. I looked for help to Papers’ support. They’re incredibly slow in replying and the only thing they could tell me was that they were aware of this problem and that the new upgrade “available anytime now” will solve the issue. I’m still waiting for such upgrade. The result is that I cannot use Papers on my iPad and I’m looking for another solution. Their support is also weird: it’s them who decides which conversation are made public. I cannot avoid thinking that they make public only discussions of issues they’ve solved, and keep private the ones they couldn’t fix… to give a good image. So I don’t recommend Papers. I took the plunge and bought Sente for iPad based on this article. I’m sorry I did. It’s so buggy it’s unusable – crashes constantly on my iPad 3 / iOS 6. What’s worse, the developers are offering no support at all. My advice to anyone reading this article, stay well away from Sente. You’ll be wasting your money on a buggy, unpolished and unsupported disaster of an app. Really helpful review! Can you comment on how easy it is to edit or create new citation/bibliography styles in Sente vs. Papers? I currently use RefWorks, which is straightforward when I’ve had to modify styles before (ie. Vancouver), but I want to switch to either Sente or Papers, and want to know if it’s just as simple to get that done. I’ll also need to format conference abstracts/posters, so this is an important consideration for me. Papers has some deal that you can get a free license if you send in a new citation style. I imagine that this let them have a great number of styles. Great recap of the two products. I am a user of both, with just adding Sente 6.5 today to the collection of tools for managing of reading material for my dissertation program as well. I’m finding for short course work items at the moment that Sente may be where I will stick the effort, but for more of the real nitty-gritty for the dissertation I will record within Papers. The most frustrating part of Sente I’ve found so far is the inability to add/modify/delete keywords. It also appears from the support pages that Papers response time is much quicker than from Sente developers – discussion threads are back to 2009 with the same topic and no internal response. You are right with the keywords… they disappear when you change to edit mode. Strange… I never needed them, so I didn’t even know that. Thanks for pointing this out.